I have been a teacher for 27 years, a Headteacher for 12 years and, at the age of 51, this much I know about what Ernest Hemingway would say about assessing KS2 writing. Hemingway would be working towards. Meeting this afternoon with a teacher from The Joseph Rowntree School and our Year 6 teacher colleagues from our local partner primary schools made me realise that Hemingway would be judged as Working Towards Expected Standard at the end of Key Stage 2. We facilitated a KS2 writing moderation session where our Year 6 colleagues forensically examined several pupils’ written work from the different schools. Each teacher came with a pupil’s work s/he considered to be meeting the expected standard. They pored over scripts trying to find examples of certain grammatical constructions and then ticked or crossed a checklist derived from the Interim frameworks for teacher assessment at the end of key stage 2, which the Local Authority will use to moderate their assessments next term. All agreed unanimously that every single pupil’s work was working towards rather than meeting the expected standard. How are your fronted adverbials? I know that sounds a little rude, but pupils are being taught fronted adverbials as one of the grammatical constructions they should include in their writing. Fronting your adverbials is, essentially, where you stick the adverb at the front of the sentence. Amazingly, that is all it is. Depressingly, insisting pupils use fronted adverbials in their writing to prove they can use fronted adverbials, leads to writing which is mechanistic and hollow-sounding. Exasperatingly, I read far too many sentences this afternoon similar to this one: “Joyously, we walked slowly down the street.” A FRONTED ADVERBIAL! Tick the Fronted Adverbial box NOW! To demonstrate that pupils have met a standard within this interim framework, teachers will need to have evidence that a pupil demonstrates attainment of all of the statements within that standard and all the statements in the preceding standard(s). (The bold emphases are from the document, not mine). In the light of the above, it is impossible to condemn any teacher for resorting to a checklist to ensure that every single statement is covered in a pupil’s work. Miss just one statement of the preceding standard and that pupil has had it. This afternoon, the work of Pupil A could only be judged as working towards the expected standard because we couldn’t find the use of a single colon in his/her entire portfolio of work. Otherwise, the work would have been judged to have met the expected standard comfortably. Our Year 6 colleagues felt professionally compromised. They were looking at pupils’ work which communicated clearly, with considerable flair, and had to condemn it as working towards the expected standard because a single feature of SPaG was missing. They are professional assessors with years of experience but their hearts were sinking as the afternoon wore on. Surely it was never meant to be like this? There is another way. 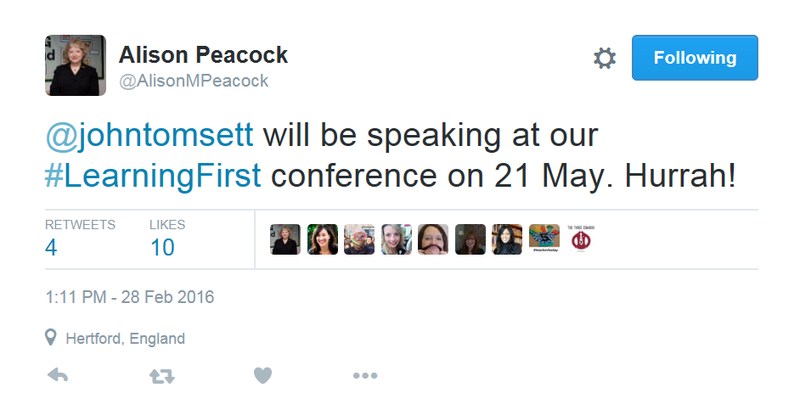 Dame Alison Peacock is facilitating a day on 21 May at Sheffield Hallam University entitled The #LearningFirst launch conference. It will bring together a community of professionals who are determined to devise and share strategies for high quality teaching that refuses to be dominated by ticking boxes, gridding or cramming. It is already sold out, but there is a promise of satellite conferences across the country over the coming months. Love over fear. We have to eliminate our fears about assessment and focus on truly great teaching and learning. 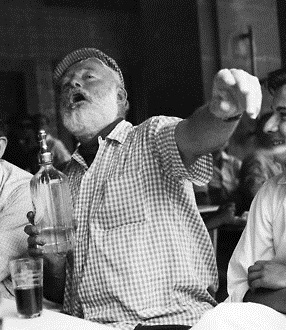 Thrillingly, I will be speaking in Sheffield with the spirit of Hemingway about me – I bet I know what he’d say about those blasted fronted adverbials! Wow, this sounds familiar. Not only looking for criteria, but counting how often these specific criteria were used! We now click classroom monitor which takes hours and hours. Problem is students use. . . then forget to use specific criteria. Without test conditions and with groupings, they achieve their targets, but should we worry that they collaborated and copied? Can we highlight the hexagon?! Why does everything have to be measured and what are we hoping to achieve? Can we please stop all this mindless rubbish. Happy and fulfilled children, good relevant.planning which fulfils criteria and a joy of teaching. . . These should be our goals. A point well made! Although that sentence is not an exclamation according to the DFE. This is assessment being used to drive pedagogy and nobody who knows about assessment can accept that. All the primary teachers I know don’t just feel compromised, they are furious and I suspect it will be the top agenda item at our next partnership meeting. Orwell famously wrote his novel ‘Coming up for Air’ without using a single semi-colon. One wonders what his feedback would’ve been!